Florida Dachshund Rescue View other Dachshunds for adoption. Frida has joined the GDR family and is looking for a retirement home. Frida is a 14 year old, 16 pound blind senior girl. Frida enjoys her alone time, but does love to give kisses and cuddles. Unlike most doxies, she likes to sleep in her very own bed in the kitchen. No big bed for this girl! Frida especially loves to sleep in a BIG dog bed because she is the princess and deserves that wonderful big dog bed! Frida is uncomfortable in a crate and will cry and fuss until she is let out. Frida is a quiet, loving girl, is leashed trained, does well on car rides and enjoys a calm quiet cuddle. Because of her vision and hearing impairment Frida needs a life with routine so she can feel safe and secure. Frida is very gentle and loving. Frida loves a blankie to cuddle in and enjoys a soft loving cuddle spot. Frida, like many seniors, likes her dry food mixed with some canned food. Frida LOVES to chew a bone and it makes her so happy just to enjoy a GREAT bone! Frida is a sweet old girl and sometimes she has some potty accidents. A routine is crucial to successful doxie housetraining. Frida would like a home where she could be the only dog or have one other doggy pal. She does well with cats and respectful children. 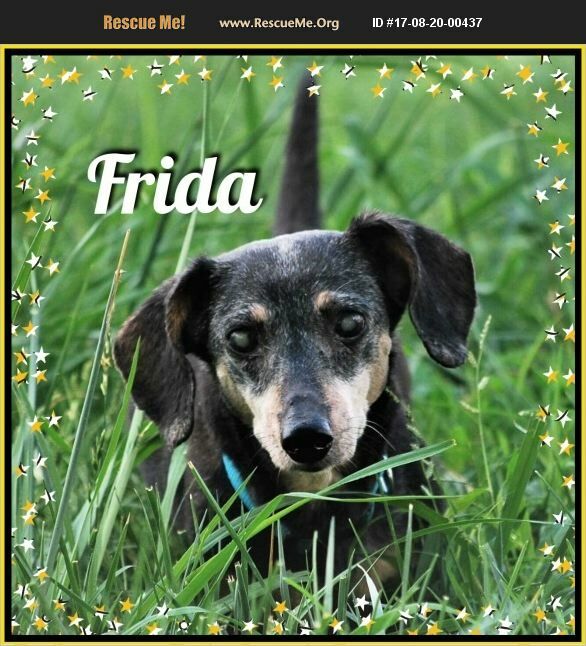 Frida would love to have a person who would devote themselves to being 'hers' so that she could develop that special doxie / person bond This super senior girl is waiting for her forever home. Will you be the one that opens your heart and offers her that love?